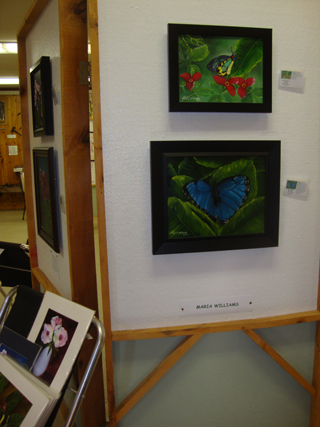 Yesterday, July 16th was a beautiful day and it was also the 4th Annual Artist in the Natural Resources Exhibit; In the Wild Garden. I participated in this group exhibition along with other NH artists which exhibited paintings and photography work. 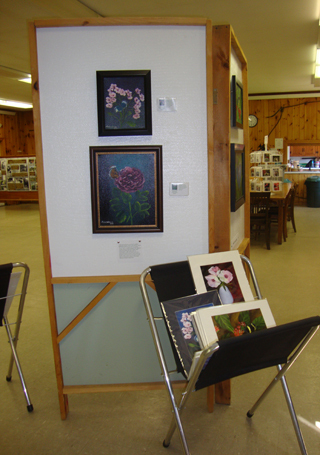 The exhibition took place at the Baldwin Environmental Center and some artists demonstrated their work during the exhibition. 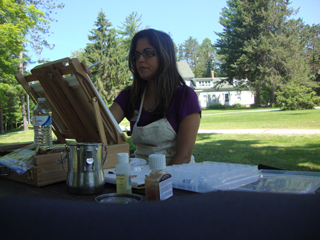 During the exhibit, I enjoyed some outdoor time demonstrating my artwork. I started working on a painting of a Rusty-tipped butterfly that is resting over some flowers. The progress of this painting creation can be viewed on my Facebook page. At noon there was a presentation called “Beautiful Backyard Habitats”; Marilyn Wyzga, author of Homes for Wildlife, co-author of Integrated Landscaping: Following Nature’s Lead and wildlife educator for the NH Fish and Game Department, talked about the process of including wildlife habitat concepts in homes, planning and plant suggestions. Some visitors did the Country in the Garden Tour which was to benefit the Fuller Public Library. This was a self-guided tour through some of Hillsborough and Deerings most stunning gardens. It was an excellent time at the exhibition!